Edinburgh Capitals’ shambolic season continued with a 7-1 loss at Coventry Blaze tonight. Short-benched Edinburgh, who are in action again tomorrow at Milton Keynes Lightning and earlier this week lost the services of Taylor Stefishen, Julius Nyqvist and Duncan Speirs who all walked out on the club, look like a team in complete meltdown and in desperate need of the replacements promised by club co-owner Scott Neil, who will surely find it tough to attract players of the required experience to the Elite League’s bottom team. Former Fife Flyers forward, Ryan Dingle, scored Coventry’s opening goal on 11 minutes, Kevin Noble and Dax Lauwers with almost identical slap-shots from the top of the circle making it 3-0 before the end of the first period which saw an end to the night for starting Edinburgh goalie Pavel Shegalo, who was lucky to avoid a match penalty after an altercation with Blaze forward Dannick Paquette. He was replaced by 17-year-old Murrayfield junior, Jordan McLaughlin. In a disastrous night for the visitors that looks to have added Juris Upitis and Sergei Banashkov to what is now a lengthy injury list, Brett Robinson made it 4-0 short handed early in the second period, with Edinburgh hitting the post through Dillon Lawrence and Konstantin Teslyukevich, before Blaze top-scorer Marc-Olivier Vallerand, and Luke Ferrara, gave Coventry a 6-0 lead after 40 minutes. 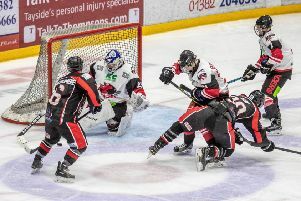 Ben Lake added the seventh for the home side early in the third period, and Callum Boyd scored a late consolation for Edinburgh.